Though we strive to improve predictability at your marina with Dockwa’s reservation tools, dockage inventory is always subject to chance. No-shows, walk-ins, and early departures all can cause a gap between expected and actual dockage availability. 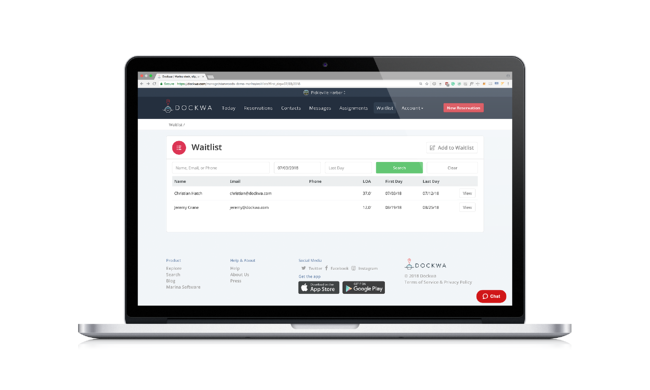 That’s why we added a Waitlist feature to Dockwa. Sometimes you may not have available dockage at the time of a boater’s request, but there might be an open space at the time of their arrival. 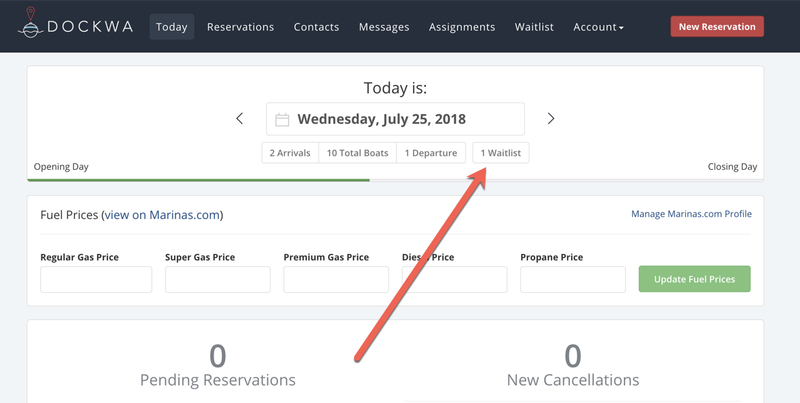 Rather than keep the reservation pending, and the boater unsure of whether they have secured dockage, Dockwa Waitlist lets you communicate the potential for accommodation. You’ll keep your queue of dockage requests clean and your boaters’ expectations clear. On the Today page of your Dockwa Dashboard, you will see a Waitlist tab under today's date. 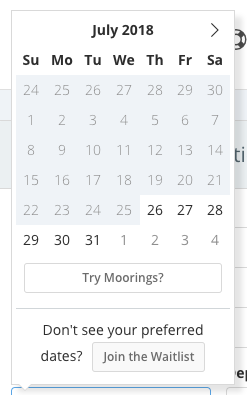 Clicking this tab will take you to your marina's Waitlist, filtered by dockage requests containing today's date. Clear the Date filter, or click "Waitlist" in the menu bar to see your all-time waitlist. You will now see two options available when declining a reservation: the traditional 'Decline' and the new 'Waitlist' option! When you select 'Waitlist,' message your boater letting them know they’ve been waitlisted and the reservation will be added to your marina's Waitlist. Within your Waitlist, you can track for potential availability at your marina. Once you have added a reservation to the Waitlist, it can easily be converted into a new reservation if availability opens. Be sure to chat or email your boater, letting them know you can now accommodate their reservation. We recommend not creating a reservation for them until they confirm they still want to book at your marina. Upon re-confirming your boater’s reservation, navigate to your waitlist via the menu bar at the top of your screen. Click “Make Reservation.” On the next screen, the boater’s original request details are preserved, so making a new reservation is a cinch. Review your boater’s new reservation details before hitting “Create Reservation.” This will notify the boater of their confirmed dockage and remove their request from your waitlist. Navigate to your waitlist of reservations by clicking “Waitlist” on your top-bar navigation. Search from your list of current contacts or add new customer details to add a reservations to your waitlist. Manually add reservations requested via email, over the phone or by radio to your waitlist in the same way you’d manually such requests to your reservation tool. 1. If you're going to add boaters to your waitlist, be sure to do so as soon as they request dockage. The success of the waitlist feature, for both you and your boaters, relies on prompt response time. If you know you can accommodate a boater, confirm their reservation ASAP. If you know you cannot accommodate a boater, decline their reservation ASAP. Not sure whether you can accommodate a boater? Put them on your waitlist…ASAP. Acknowledging a boater’s reservation request with a prompt decline or waitlisting goes is far more appreciated than saying nothing to them at all. With the Waitlist feature, you’ll never need to leave a dockage request “Pending” - all dockage request circumstances have a home. 2. Review your Waitlist on a daily basis, as boaters can add themselves to your waitlist. If your marina's Dockwa profile shows no availability for a particular date, a boater is able to add themselves to your Waitlist. You will be notified via email of a boater's self-addition to your Waitlist, but its always a good idea to monitor the list, so as to never miss an opportunity to fill a cancelled reservation! 3. Fill Cancelled reservations immediately with your Waitlist queue. Whenever a boater cancels a reservation, you can quickly fill their vacancy with your Waitlist queue. Under the "Canceled" stamp on a boater's reservation, click "View Waitlists to Fill Spot." You'll see your Waitlist, filtered by requests that match your Canceled boater's reservation details for a quick replacement! "This feature is great and I’m excited to use it in the future. This will be very helpful when I start to take reservations for next year in the winter as well. No more notes that get lost and I don’t have to decline the customer." You've mastered dockage reservations. 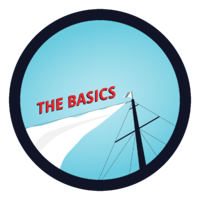 Now let's learn about how you can charge your boater for things like fuel, supplies and electric through their Dockwa reservation. Can I Change a Declined Reservation to a "Waitlist" Reservation? If a Boater Requests a Booking I Can Only Partially Fulfill, Should I Book Them for Those Days? If I Get a Last Minute Waitlist Opening, How Do I Know They Still Want the Reservation? There's a Boater Listed on my Waitlist That I Didn't Add - How Did They Get There? 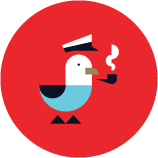 How Can I Prevent Boaters From Requesting a Spot on Our Waitlist?